As the world look to green energy and energy savings LED lights come in as a no brainer. Having a 110,000 sq ft dry and cold storage warehouse in Omaha, NE we spend thousands on electricity every year. Our LED light upgrade has saved us 50% of our electrical cost on lighting, which amounts to nearly $5000/year! On top of that LED lights are brighter and easier on your eyes increasing employee moral. Making LED lights even a better deal our power provider OPPD offers a rebate which amounts to nearly $6000. Our time to recover costs is a little over a year. So after one year we will be saving $5000/year with better lights that can last up to 20 years. What would you do with $100,000 saved over 20 years? 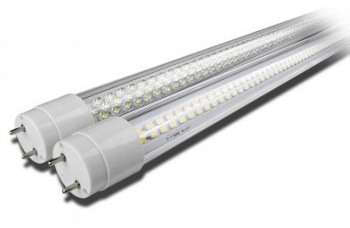 LED lights are a two lead semiconductor. When a current is added to it, it sends electrons from the positive lead to the negative lead releasing a photon as light. LED lights are relatively cheap, operating at a fraction of a cost of normal lights and last thousands of hours longer. These attributes make LED lights so popular today. Surprisingly LED lights also have a medical benefit! Florescent lights suffer from a flickering, which sometimes you can see if you look at them. This flickering actually causes migraines in many people. It was noticed in a study at LeMoyne College in NY that when their lights were replaced with LEDs people suffering from florescent induced ‍‍‍migraines dropped by 80%. The low ripple current from LEDs not only produced a better light, but it is healthier for you. Not every LED is created the same. Make sure you buy from a well respected source. We bought ours from YellowBlueLED. For more information on LED lights you can contact Dan Garvey at dgarvey@myyellowblue.com.